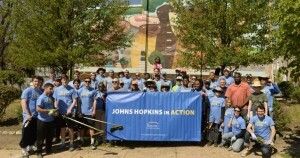 What: The fourth annual Johns Hopkins in Action day of service to Baltimore. Details: More than 300 Johns Hopkins alumni, students, parents, faculty and staff members, and their relatives and friends are volunteering for Baltimore City at 11 community sites on Saturday, May 7. Why: Johns Hopkins in Action days are a community service component of Rising to the Challenge: The Campaign for Johns Hopkins. This is the fourth annual event. — Tree planting and cleanup in Cherry Hill Park near Port Covington. Johns Hopkins volunteers will team up with employees of Bloomberg LP and Under Armour Inc., students from the charter Baltimore Collegiate School for Boys and members of the Cherry Hill community. Volunteers will help local environmental nonprofit Blue Water Baltimore plant and mulch trees and do general park maintenance and cleanup. Working at this site will be some of Johns Hopkins’ Bloomberg Distinguished Professors and several undergraduate Bloomberg Scholars. 9:30 a.m.-12 noon, about 200 total volunteers. Lead Johns Hopkins volunteer Trent Stroup, an IT manager (443-851-5763). — Maryland Book Bank, 1400 W. Cold Spring Lane. Johns Hopkins volunteers will help sort and box up books for donation, benefitting Head Start centers and social service programs. 8 a.m.-12 noon, 35 volunteers. Lead volunteer Brittany Bland, administrative secretary (410-522-8407). —The GreenMount School, 501 W. 30th St. Johns Hopkins volunteers will landscape, paint and remove litter. 10 a.m.-1 p.m., 20 volunteers. Lead volunteer Shannon Connolly, a School of Education development coordinator (302-494-9802). Bre Stifler, associate director of donor and volunteer engagement (410-292-5939).